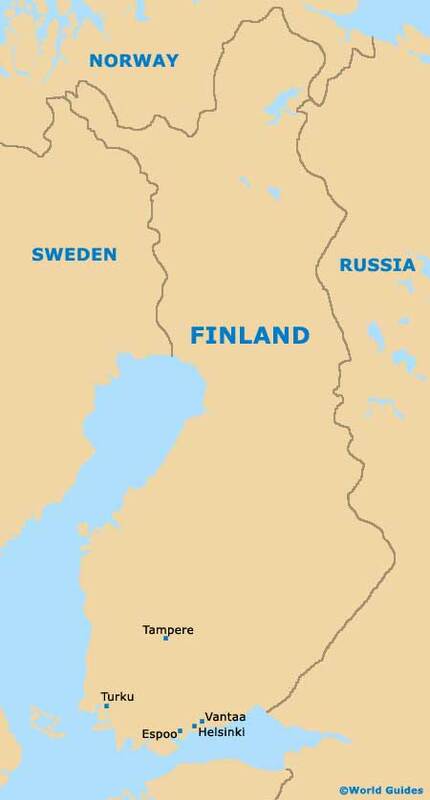 A large and important country in Northern Europe, the Republic of Finland lies to the south of Norway, west of Russia and east of Sweden. Although Finland is very much a modern, 21st-century country, many of its cities, towns and villages still boast a rich history and heritage, with plenty of old buildings remaining. Finland is home to some truly enormous areas of untouched countryside and beautiful natural parks, along with almost 200,000 lakes and many small islands. An increasing number of tourists choose to visit Finland during the winter months, when the famous Northern Lights are clearly visible and Lapland is filled with Christmas festivities. The warmer summer season is also a busy time in Finland and many people simply enjoy the relaxing recreational activities available at this time of the year, such as fishing, golfing, sailing and swimming. Summer is also a time when numerous international festivals are held, including the Juhannus (midsummer festival) and Helsinki-paiva (Helsinki-day) in June. The long hours of daylight mean that there is always plenty going on, both day and night. Helsinki is Finland's capital city and is situated on the southern side of the country, next to regions of Espoo and Vantaa. Truly cosmopolitan, Helsinki was founded in the mid-16th century and has been the capital for around 200 years. A notable city on the westerly fringe of Finland's capital of Helsinki, Espoo is surprisingly large and is actually the country's second-largest city. Espoo is widely considered to be a part of the Greater Helsinki region and is filled with interest. The Finnish capital, Helsinki is located alongside the Gulf of Finland and was founded during the mid-16th century. Recently hailed as Europe's 'Capital of Culture', Helsinki is an extremely cosmopolitan and captivating city. A beautiful city and relatively compact in size, Tampere is sandwiched between the Nasijarvi and Pyhajarvi lakes, which are linked by the Tammerkoski Rapids. Many of Tampere's industrial buildings have today become trendy restaurants. The most historic of all the cities in Finland and once the Finnish capital, Turku is at its busiest during the summer season, when tourists flock here to sightsee. Crowds always gather around the banks of the River Aurajoki, in central Turku. Part of Greater Helsinki and a satellite suburb of Finland's capital, Vantaa is very much its own city and home to a busy international airport. August is perhaps the busiest month in Vantaa, when the legendary Ankkarock festival takes place.